Science is all around us, as your child will discover as his education progresses. But learning the intricacies of this vital subject can be challenging for some students. 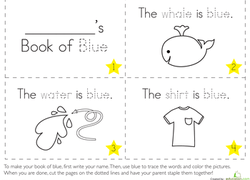 Our science worksheets meet this challenge head-on by giving your child added guidance in such topics as human body parts, the solar system, forms of matter, and even plant life cycles. Regardless of grade level, we’ve got a worksheet that will bring out the best in your budding scientist. Does your kindergartener ever wonder what makes the Earth dark at night and bright during the day? Kids colour just the things they can taste on this year one science worksheet. This activity allows you to learn a fact about each one of our nine planets. colour in the planets then turn the worksheet into a fun and educational placemat. Learn what distinguishes a meteoroid, meteor and meteorite with this outer space science sheet! Learn all about your body's most important muscle: your heart! This simple diagram is a great way to introduce your little biologist to his heart. What Keeps the Moon in Orbit? Have you ever wondered what keeps the moon in orbit? Newton's first law gets a quick introduction, too, in this worksheet for kids. Check it out! Without light sources, we wouldn't have any light. Can you imagine a world without any light sources? This Awesome Anatomy coloring page is all about the human eye, and makes a handy study tool as well! Cells are the building blocks of all living things! 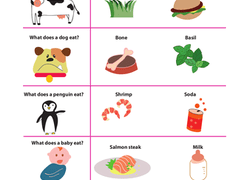 Help your little scientist learn the basics of a cell with this fun activity. This handy diagram on the awesome anatomy of the human skeleton will help you learn the names of major bones. The cell is the "building block of all life." 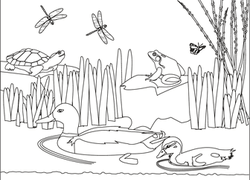 Young biologists will learn about some of its most important parts by completing this colour by number worksheet. Science buffs and biology beginners alike will enjoy testing their knowledge with this worksheet on human cell structure. Jump into science with a lesson in our sense of hearing with this coloring page that asks kids to colour the pictures of things they can hear. Find out the the cool science behind ice cubes with this fun worksheet. Here's an introduction to different types of rocks. Looking for a year five worksheet to help your kid with science? This printable will test his knowledge of the water cycle. Where'd that shadow come from? Next time a scary shadow crosses your path, you'll know just what to look for. A love of science can open up a world of possibilities for young learners. You can encourage an understanding of, and passion for, all branches of science at home. The resources above cover the key science subjects that your child will learn in school, from simple experiments to Earth and space science worksheets. Find out which areas of science your child enjoys most, and which might be more challenging. Be sure to select a mixture of both when downloading and printing. Here are some other ideas for instilling in your child a love of science. When studying biology topics that require memorization, such as habitats, landforms, or anatomy, encourage children to make flashcards or a homemade game of Go Fish. To make the game, write the word and its definition on an index card, for example: "Peninsula - A body of land surrounded by water on three sides". On a separate index card draw a peninsula. Then, play Go Fish with your cards and some friends! For younger students learning about the difference between living and nonliving things, peruse a magazine with your child. Point to objects in the magazine and challenge your child to determine if they are "alive", "once alive" or "never alive". Consider subscribing to a science education magazine, such as National Geographic Kids, to inspire more science learning at home. Science is best learned through hands-on experience. Make sure to check out the local science museums and wildlife centers in your area to bring science to life.